A slackened chain will decrease your ability to transfer energy to the pedals of your mountain bike. Your shoes can easily get caught in a loosened chain during hairpin turns, resulting in painful slide outs on the trail. All multigear mountain bikes are equipped with a high-tech component known as the rear derailleur. According to bike expert Sheldon Brown, the rear derailleur features a tension pulley that keeps the chain tight while it moves between the various cogs of the rear cassette. 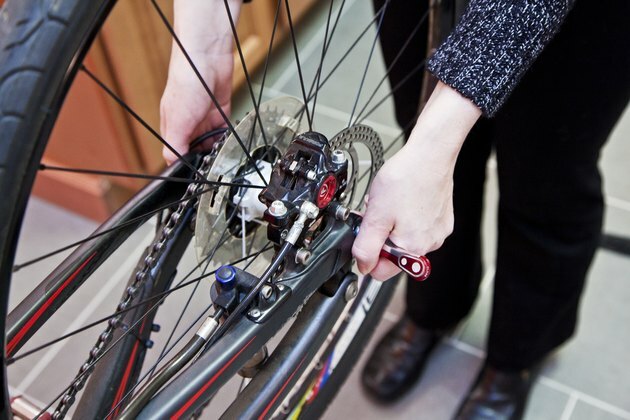 You can also move your rear wheel to adjust chain tension. Place your hand under the top tube of the mountain bike frame. 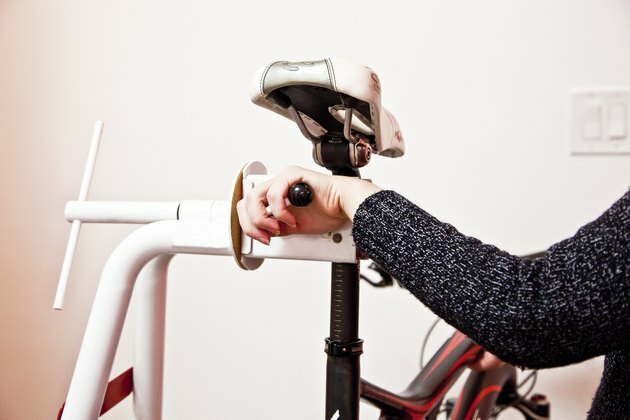 Wrap your opposing hand around the vertical seat post. Lift your mountain bike to elevate the tires above the ground. 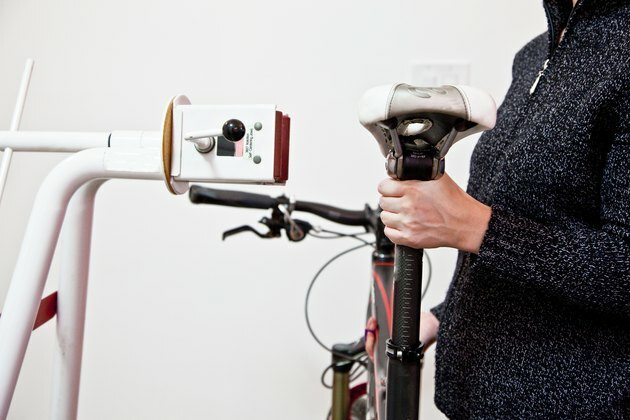 Position the seat post of your mountain bike into the clamp of a repair stand. Pull down the clamp lever to secure the bike in place. Step behind the rear tire for full access to the rear derailleur. Locate the derailleur screw that has the letter "B" printed below it. Insert your screwdriver into the B-tension screw. Rotate the derailleur screw counterclockwise to decrease the tension of the chain. Turn the B-tension screw clockwise to tighten the chain around the teeth of the rear sprocket. 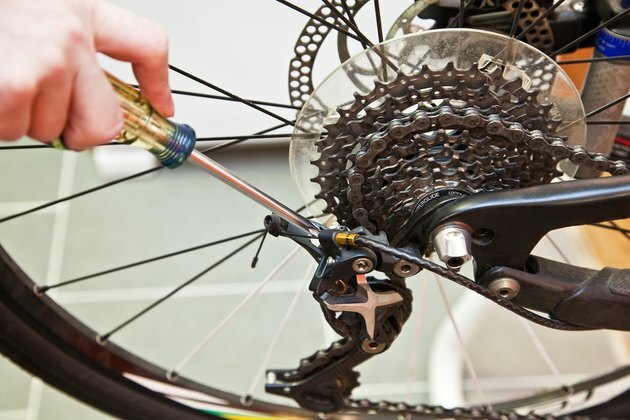 Lift the release lever of your mountain bike brakes to disconnect the correlating cable. Raise the quick-release lever located in the middle of your rear wheel. Slide the wheel axle backward in the rear dropouts to increase the tension of the chain. Push the wheel axle forward in the rear dropouts to decrease the chain tension. 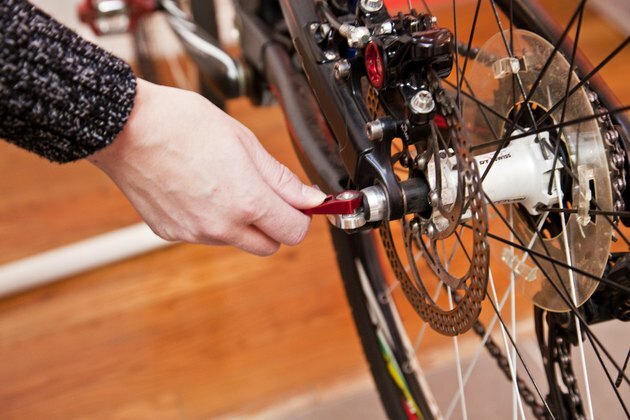 Lower the quick-release lever after adjusting your chain tension. 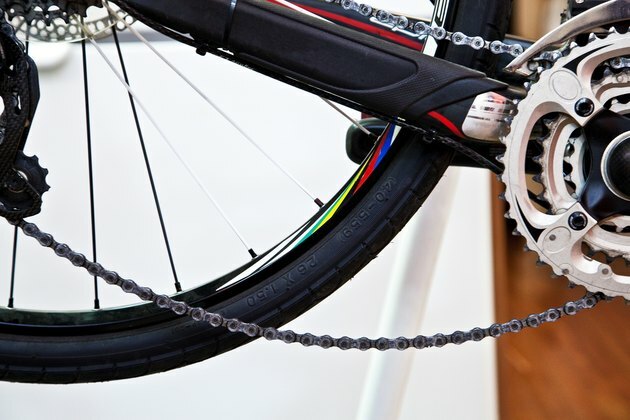 Check the tension on your chain every time you go out for a ride. Make it a habit, instead of an emergency situation. Carry a first aid kit in your back pack when you go out for a ride.